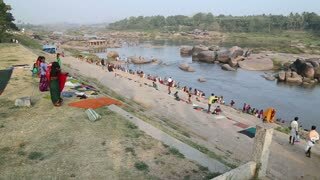 HAMPI, INDIA - 28 JANUARY 2015: People on the Tungabhadra river in Hampi. 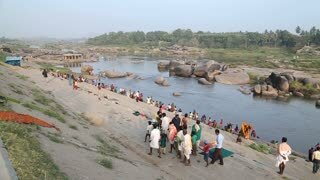 HAMPI, INDIA - 28 JANUARY 2015: People looking at the elephant in the river. 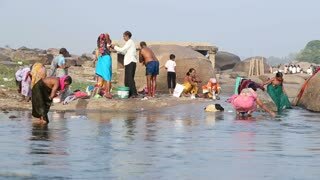 HAMPI, INDIA - 28 JANUARY 2015: People bathing and washing themselves on the river in Hampi. HAMPI, INDIA - 28 JANUARY 2015: View on the riverbank of indian river Tungabhadra. 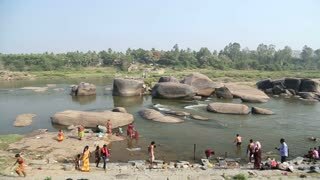 HAMPI, INDIA - 28 JANUARY 2015: People having bath on the Tungabhadra river in Hampi. HAMPI, INDIA - 28 JANUARY 2015: Elderly indian man looking at the camera on the Tungabhadra river. 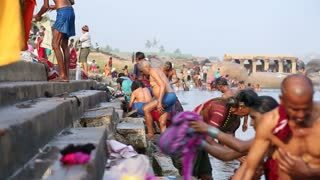 HAMPI, INDIA - 28 JANUARY 2015: Indian people taking bath on the river. 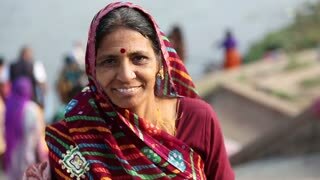 HAMPI, INDIA - 28 JANUARY 2015: Portrait of indian woman on the Tungabhadra river.